You may have already heard of OLED technology as the 'future of TV screens'. It's already starting to gain success in mobile phones, and over in Japan, it's been released as a TV. OK, maybe a tiny TV at 11 inches, the Sony XEL-1, but the good news is the UK looks set to get its hands on it next year. "I'd be very surprised if this hasn't arrived in the UK by 2009," said Sony's Christian Brown. "We at Sony think this is the future." There's no word on pricing for the UK as yet, but it costs $2,500 (£,1250) in the US and will likely retail for the same amount over here. The interesting this is this set was unveiled as a kind of prototype for what could be when it came out in Japan. Rumours state Sony is making a loss on each set, as it attempts to show the world what OLEDs are all about. The XEL-1 comes with 1,000,000:1 contrast ratio, with an ultra thin form. If the UK gets a similar model to Japan, it will also come with two HDMI ports, a memory stick port for high resolution photos, and networking capabilities thanks to Ethernet. It also uses the Xross Media Bar Sony has been keen to use across all its products, and will be seen in the new Vaio laptops and the PS3 and PSP so far. 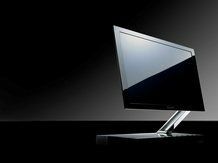 "I think some people in the UK will be interested in this screen," said a spokesperson for Cambridge Display Technology, which develops a type of OLED material used by a large number of companies for possible TV manufacture. "However, people are not as mad for the technology over here [in Europe] as in Japan; they might want bigger screens." The spokesperson went on to say the larger OLED screens, those that might rival LCD and plasma, would likely be over in the UK in around three years time. However, these are likely to appeal a select few too, as the breathtaking pictures will be offset by sky-high price points initially. "Europeans are more careful with spending their money," said the spokesperson for CDT. "They prefer to have a more finished product, something they want to know works properly. Even when LCD and plasma first hit, not everyone bought one straight away over here." If you haven't seen an OLED TV in action, YouTube has a great video to highlight all the best features of this new and upcoming technology.